Weighty Matters: Coca-Cola's New Slogan - "Movement is Coca-Cola"
I first reported on their new language a few weeks ago in a Coca-Cola ad coming out of Chile. Simply put it goes like this. Coca-Cola's primary slogan is, "Open Happiness", with Coca-Cola presumably being the happiness. 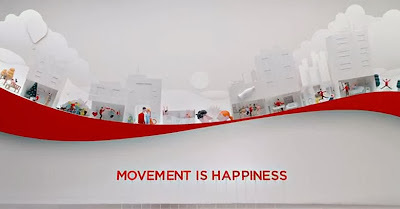 Well now they have a new secondary slogan, "Movement is Happiness" (see video down below by the same guy who brought us that famous Chipotle Scarecrow ad). Transpose one for the other and now we have Movement is Coca-Cola - reinforcing their primary message that if you just run around a little, you can drink all the Coca-Cola you want. Think that transposition is unintentional? Not me. I think it's paying for some advertising executive's kid's private education.